Receipts, parking stubs, old newspapers, plastic bags, crumpled cans, worn down slivers of soap and hotel-size shampoo are the stuff of Gabriel Kuri’s art. Kuri has a particular fascination with cast-offs and the ephemera generated by the commerce of daily life. Nobody needs to know the price of your Saab at the Blaffer Art Museum is a ten-year survey of Kuri’s work organized by Director and Chief Curator Claudia Schmuckli, and presented in conjunction with the celebration of the Mexican Bicentennial. When you enter the Blaffer, the first thing you see is a series of fans attached to the lobby ceiling, each blowing to inflate a cluster of plastic shopping bags. They tell us “Thank You!” or “Gracias.” These bags are the urban equivalent of tumbleweeds (as filmed, famously, in the film American Beauty). Once they break free from the purchaser, they blow through parking lots and over highways, only stopping when the become lodged in the branches of a tree or stuck in a fence. In Kuri’s hands, they are lovely ethereal things rather than litter. The 2004 work is titled Thank You Clouds. Another bag turns up in the show, this time hung on the gallery wall: Untitled (Gracias Thank you), 2003. The words “Gracias” and “Thank you” are printed in blue under a smiley face on a translucent, institutional green plastic bag. A brochure for an enema product called “Microlax” is inserted inside the bag. It’s not a coincidence that the giant rock on the cover of the brochure, apparently signifying impacted crap, is visible underneath the Smiley. The wan smile on the face makes me think these two things were originally distributed together. Did I mention that Kuri has a sense of humor? More consumer ephemera appear in Column 2007-2008. A year’s worth of the artist’s receipts, arranged by date, are stuck on a metal spindle that seemingly extends to the heavens. A parallel metal rod is strung with paper numbers, the kind used to determine when you will be served, most often used in hellholes like the Department of Public Safety. These too are arranged in order. The spindle rods are set into a bowl-shaped chunk of concrete at the floor and ceiling as if they are a continuum between two worlds. All those little receipts are a record of Kuri’s wants and needs, a view into his life through the lens of consumerism. Each number represents a chunk of time the artist spent standing, waiting to buy or to ask something. The two-story piece conveys a sense of tedium and the passage of time. How many trips to the grocery store will you make in your lifetime? How will the purchases on your receipts change? Beer, cigarettes and Ramen noodles in your twenties? Diapers and rice cereal for the baby? Frozen pizzas for your teenagers? What are the empty nesters and retirees buying? What food would you no longer buy if you lost your partner? Our receipts are like diaries. 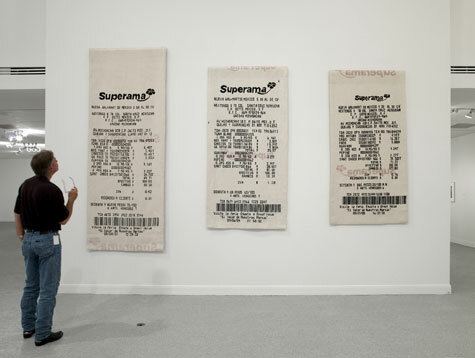 Kuri makes other receipts monumental by having them exactingly recreated as tapestries by weavers in Guadalajara. His receipts from a Superama Wal-Mart in Mexico detail purchases that include pumpkin seeds and Cheetos. The receipts are dated ’03, ’05, and ‘09 but contain mostly the same items. Kuri tried to recreate his ’03 purchases on each receipt. According to the receipts, the price of Cheetos is on the rise. It’s a wonderfully absurd project, trying to exactly reproduce a buying experience at an anonymous discount chain in purchases six years apart and then memorializing the action with such a beautiful, labor-intensive, handcrafted object. Another grocery store-fueled work, Model for a Victory Parade, 2008 is one of my favorite pieces. 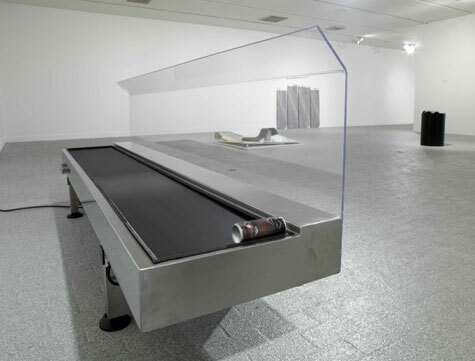 It’s a checkout conveyor belt with an empty bent can of energy drink stuck at the edge of the belt, eternally rotating. As it does, it makes a hollow, clanking sound that seems far way. I was tempted to pull the plug and see if the sound really did stop. Kuri has generated a whole lot of pathos from an empty can. Other works that use scraps of granite slab feel a little off, even though they are apparently cast-offs from a stone fabricator, they read as if Kuri has ventured into minimalist sculpture. He undercuts this somewhat by arranging a row of partially used hotel toiletries in a row along their edges or sandwiching a parking receipt between two slabs as tightly as he probably had to park his car between two other vehicles. The problem is that the average viewer recognizes receipts and old cans as cast-off, but unless they happen to know the story behind the stone slabs and their rounded edges, the pieces don’t make a lot of sense. It’s a great show overall, but there are works which seem too hermetic and are frustrating. 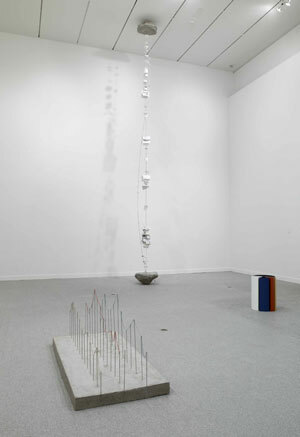 An example of this is Overlapping Statistics (Blind Olives Eyelid), 2007, a sculpture whose list of materials includes “Painted plywood, weatherproof roofing roll, painted glass, tissue box, painted jar, insulation roll.” These items are stacked in layers, a jar of olives propping up one side. Maybe there is some obvious idea or charming story behind it that I’m missing. But really, the piece isn’t visually intriguing enough for me to want to make that effort. When Kuri makes work this visually uninteresting and obscure, it feels spoiled and self-indulgent to me. I’m not advocating for the pat and obvious, but you should give the viewer something. For A Satisfied Customer, 2008, Kuri draped two tables with royal blue felt, as if he is displaying something precious. Carefully arranged across its surface are thin slivers of soap, used almost to nothingness. These things may signify any number of things for Kuri personally, but the felt and the soap carry with them enough connotations and associations that the viewer himself has something to work with. Kuri’s art is poetic and subtly engaging. Making this kind of work requires a delicate balance that is tough to pull off consistently. However, Kuri does just that – it is the rare work that is so subtle that it slips completely from the viewer’s grasp.